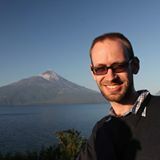 I am a postdoc in the Warwick Astronomy and Astrophysics group. I am currently working with Pier-Emmanuel Tremblay on white dwarfs in the Gaia survey. My academic CV can be found here. I am primarily concerned with the study of white dwarfs. This type of stellar remnant represents the end-state for the 95%+ of main-sequence stars with masses below 8 Solar-masses, which will not undergo a core-collapse supernova. Instead, while in the giant-star phase of evolution, the outer 50% of the star will be ejected in an intense stellar wind. The remaining 50%, no longer producing pressure via nuclear fusion in the stellar interior, is unable to contend with the intense gravitational forces. The core thus collapses until the quantum-phenomenon known as electron-degeneracy pressure can balance gravity. The result is a hot (100000 K), immensely dense, Earth-sized object -- the white dwarf. The interior of a typical white dwarf is mostly (99%) a mix of carbon-oxygen ions in a sea of degenerate electrons. Around this, is an envelope of helium (about 1% of the mass), and usually, a final shroud of hydrogen (0.01% of the mass). Our telescopes of course can only directly see the outer-most layers and what they're made of. Therefore the interior composition is constrained from our theoretical understanding of how stars evolve, but also from observations of pulsating white dwarfs where waves travelling through the interior make it to the surface, providing information on the density of the central carbon-oxygen core. Because white dwarfs do not fuse-nuclei in their cores, they instead radiate away their internal energy, at first cooling rapidly, and then much more slowly the temperature of the white dwarf outer layers decrease. The oldest white dwarfs known to the Milky Way can have cooled from an initial 100000 K to a relatively cool 3000 K (only half the temperature at the surface of the Sun). Because the processes that affect white dwarf cooling rates are fairly well understood, the coolest (and thus oldest) white dwarfs provide firm constraints on the age of the Galactic disk. The Gaia satellite, placed in 2013, has been precisely measuring the positions of about 1 billion stars. In particular it measures the stellar parallax, the effect of stellar positions subtly changing as the satellite orbits the Sun (in tandem with the Earth). The stars nearest the Solar System have the largest parallaxes, and so this provides the most accurate way to measure distances to our nearest stellar neighbours. Thanks to Gaia Data Release 2 (DR2) in April 2018, the parallaxes of one billion stars are now publically available, for which about 260000 are for white dwarfs. This has increased the number of known white dwarfs almost ten-fold, and allows us to learn about these objects in entirely new ways. One of our major new results, which would have previously been impossible, is the confirmation of crystallisation of the carbon+oxygen ions in white dwarf interiors (see select publications below). Thanks to Gaia, great strides are being made in many areas of astronomy, and so it is an exciting time to be studying white dwarfs. The transition from the main-sequence to the white dwarf stage should only destroy the very inner-most part of their planetary-systems, and so white dwarfs should continue to be orbited by planets for many Gyr after their formation. We now see direct evidence for these planetary systems resulting from the disintegration of asteroids (and occasionally comets) which venture too close to the white dwarf. Once within about a Solar-radius of the white dwarf, gravitational tides, can shred an asteroid into dust, forming a debris disk which slowly accretes onto the white dwarf surface. These disks -- heated by the nearby degenerate star -- can be detected via their emission of infra-red flux. The chemical elements that make up the asteroids that have fallen onto the central star can also be detected, as they temporarily alter the composition of the white dwarf outer layers. Measuring the relative amounts of these elements (e.g. O, Si, Al, Mg, Ca, Fe, Ni), means we can directly determine the composition of extraSolar asteroids -- the building blocks from which exoplanets are formed. For around 20% of white dwarfs, a magnetic field can be detected. These range from a few kiloGauss (few 0.1 Tesla) all the way up to 1 GigaGauss (100000 Tesla). How these fields are formed is still a matter of debate with suggestions of Fossil-fields from the main-sequence, dynamo generation during the giant star phases, dynamo generation in the disks of accreting white dwarfs, or though the process of interior crystallisation (or maybe some combination of several of these). Magnetic fields can detected either through circular polarisation of light from the white dwarf, or (more commonly these days), via the Zeeman effect that typically causes spectral lines to be split into three closely spaced lines, where the degree of the splitting corresponds to the field strength. The most magnetic white dwarfs known, have fields that cannot be generated in an Earth-based lab and so provide a unique way to learn about how atoms behave when subjected to extreme magnetism. Unlike objects in our day-to-day lives, white dwarfs become physically smaller as they become more massive. This leads to a limit known as the Chandrasekhar-Mass (1.4 Solar Masses), at which point the electron-degeneracy pressure can no longer support the mass of the star, and so runaway nuclear fusion occurs resulting in the explosion of the white dwarf as a supernova called a type Ia. For this kind of supernova to occur a white dwarf must grow in mass until it reaches the Chandrasekhar-limit. This is possible for white dwarfs who have a close binary companion star. Either the white dwarf pulls material from a "normal" star, slowly growing its mass, or two white dwarfs can merge forming an new white dwarf that exceeds the Chandrasekhar-Mass which undergoes rapid collapse. Recently a new subclass of type Ia supernovae has been identified called type Iax. The Iaxs are much less luminous than normal type Ia supernovae, suggesting that the white dwarf does not fully explode leaving behind some intact fragment of the former star, which is then ejected from the binary star system. In 2017 an usual white dwarf called GD492/LP40-365 has been identified which fits the description of a surviving remnant from a type Iax supernova. GD492 moves through the Milky Way so fast that it is essentially being flung out of the Galaxy. Furthermore it has a truly remarkable surface composition -- instead of the usual hydrogen or helium atmosphere typical of white dwarfs, these elements are entirely absent, and instead a unique atmosphere dominated by oxygen, neon, and magnesium is seen, with traces of heavier elements all the way up to nickel. The set of elements and their abundances are signatures of nuclear burning of carbon, oxygen, and silicon. Stars like GD492 therefore provide a novel way to study a nearby objects and connecting them to supernovae seen distant Galaxies.